From my table to yours! 1/4 cup hot sauce (more or less depending on how spicy you want the wings). Butter or margarine about a tbsp or two. In a pot, melt the butter then add the sauces and the red chili flakes. Cook the sauce for a few minutes and as the sauce begins to thicken, turn the stove off and remove the sauce away from the stove. Mix the chicken well and deep fry them. While the wings are frying, take a frying pan and place it on a medium heat stove, then add about a teaspoon of butter and melt it, next add some of the sauce. The wings are ready when they are fully cooked, golden in colour and crispy..When the wings are ready remove them from the fryer and put them in the frying pan with the sauce and toss them around so they coat the sauce evenly. 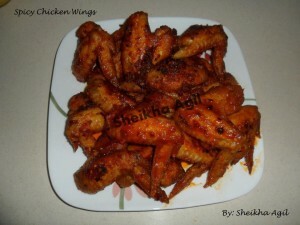 The wings will start coating and taking in the sauce and the heat will dry out the sauce as well. Just remember to toss the wings so they don’t burn and they coat the sauce evenly..
Repeat the steps with the remaining wings..
**Deep fry the wings in batches so they don’t overcrowd each other. **Also sauce the chicken wings in batches. After deep frying and saucing all the chicken wings, serve them in a serving plate with your choice of dipping sauce..
© 2016 Swahili Delicacies. All Rights Reserved.